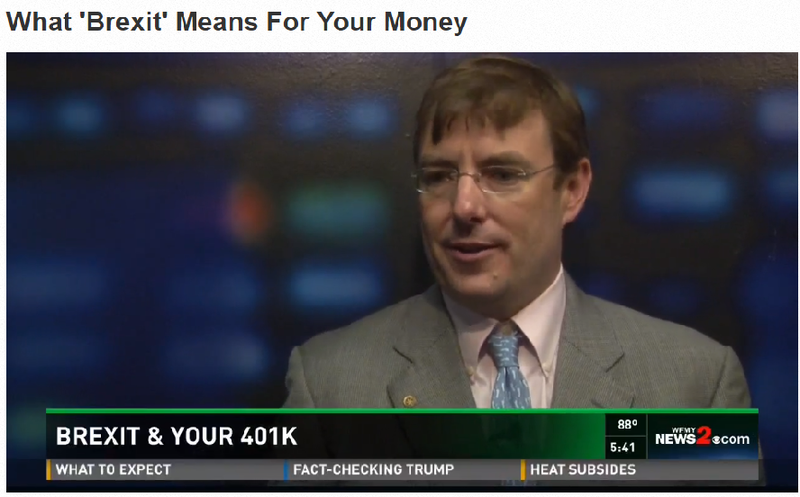 Click here for my most recent WMFY News 2 Interview about what you need to know about "Brexit"and your 401k. Are you a long term investor? Do you remember the devastating impact caused by Brangelina on your investments? No? Well, for the long term investor, Brexit will likely have the same impact on your finances. None. 1- While many people had predicted that the EU’s Euro would supplant the United States’ dollar with the worlds currency years ago when the EU began, now it appears that prediction may have been slightly short sited. The US Dollar remains the world’s dominant currency and this move does more to secure the US dollar’s long term role. Without Britain, the Euro is less of a power in the world and that gives more power to the US dollar. The EU is very large and combined makes up the world’s third largest economy behind the US and China. This does set them further back in economic size as the 2.76 trillion dollar UK exits the EU. 2- We live in a global economy. Even investing in many US companies will ultimately include some sort of investment in Europe. This is the root of the reaction as fears grow about currency exchanges and the like. The markets are not a big fan of change overall and especially unpredicted change. Yesterday the markets rose as Wall Street predicted incorrectly that England would stay in the European Union. When we awoke to news that the tight vote went the other way, that has led to markets pulling back. Many large multinational companies will evaluate their operations in England and may decide to relocate as some large banks have threatened. 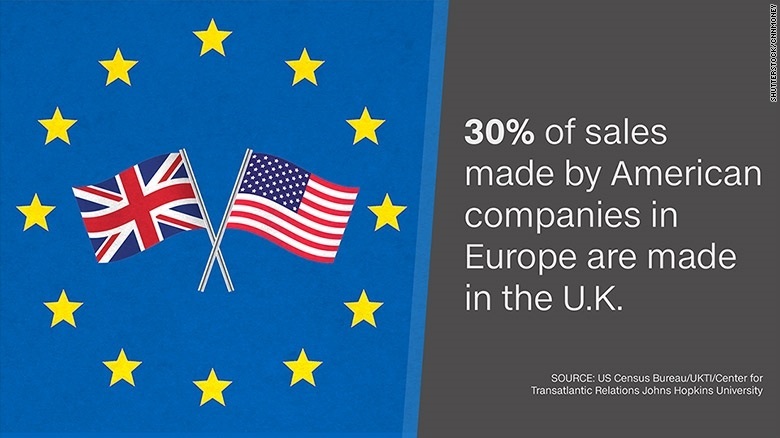 According to the US Census Bureau 30% of sales made in Europe by US companies are made in the United Kingdom. This exit could have effects on the British economy in the short and long term although for the average long term investor with a balanced portfolio this will likely be a non-event. 3- Short term reactions will include currency, oil prices and companies with a strong presence in Britain. As Britain begins the 2 year process of exiting the EU and changing from Euros to Pounds, there will be short term reactions. Gold is on the rise this morning as those who have reacted looked to purchase gold as a stabilizer for their investments. Oil prices have dropped significantly as well off of a stabilized time. This is more to do with exchange rates than anything as oil prices are tied so tightly to exchange rates. Those short term fluctuations may cause changes in what you pay at the pump to fill your car up or make that trip to Europe that you and your family have always wanted to take a little more affordable by making the dollar stronger in comparison. How should long term investors react to the recent Brexit news. Depending on your circumstances, this, like many short term investment pullbacks may represent a buying opportunity if your personal financial situation allows you to do so. When the markets pull back, whether based on emotions or numbers, stocks cost less. Although your instinct is usually to sell when markets slide, investing is counter intuitive. That means that what feels right is many times not the right thing to do. When the market pulls back, whether based on reality or emotion, this can be seen as an opportunity to buy at a lower price than normal. For the long term investor, this could be an opportunity much like the oil price drop in January when markets pulled back. You could buy companies at a lower price than normal. In the long term, I expect all to stabilize and this whole Brexit event will likely will have the same consequences that Brangelina had for you long term investors: none. Feel free to visit my website at www.mattloganinc.com or email me at [email protected] if I can be of any assistance with your financial health. Matt Logan is a Representative with Matt Logan Inc and Summit Brokerage and may be reached at www.mattloganinc.com, 336-808-0126 or [email protected].